Visiting an Asian bakery, be it Chinese, Japanese, or Korean is like stepping into a bread heaven. Most of the time, I think these bakeries share roughly the same kind of dough recipe. 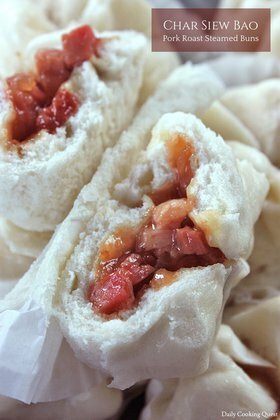 They are invariably soft and pillowy, milky and buttery, and almost always filled with all sort of wonderful ingredients ranging from sweet filling such as bean paste, custard, and sweet cream to savory filling such as this ham and mayonnaise, sausage, meat floss, and pizza toppings. If you have ever stepped into Asian bakery, you know what I am talking about. Walking into such bakery will immediately require my utmost restraint if I don’t want to end up with bags of bread and a hole in my wallet. Personally I like bread with sweet filling more than the ones with savory filling, but my husband is the other way round, so of course I have to compromise and alternate between making bread with sweet and savory filling at home. Today I am making bread rolls with ham and mayonnaise because I have a package of black forest ham and a jar of mayonnaise sitting in my fridge, so I make them into bread rolls instead. Left: prepared rolls ready to be proofed again. Right: squeeze some mayonnaise on top of proofed bread rolls. 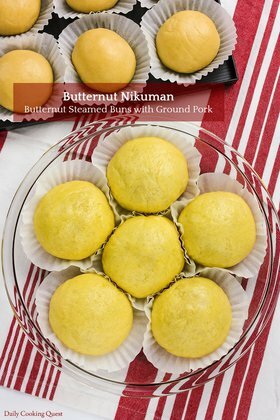 I learn about the method to prepare this ham and mayonnaise bread rolls from Japanese cooks community, don’t you think this is such a fun way to shape the bread? I took multiple photos showing a step by step on how to make this roll, and I hope it can do a much better job at describing the necessary steps than me writing it down for you, though I will still try to do my best in the recipe below. 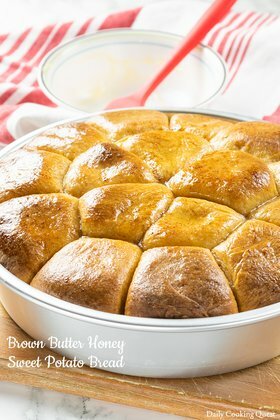 Once the bread rolls are all prepared, place them on a parchment paper inside a baking tray. Let the bread proof again until the size is about 150% from the original. This should take about 1 hour in a warm kitchen. Japanese mayonnaise such as Kewpie usually comes in a handy bottle and you can squeeze mayonnaise out straight from the bottle, otherwise, transfer some mayonnaise into a piping bag and pipe some onto each bread rolls. Once the oven is preheated to 200 Celsius (400 Fahrenheit), bake at middle rack for about 20-25 minutes until the bread is golden brown. You can top the bread with toasted crushed nori seaweed like what I do, or you can top with some chopped fresh parsley, or just leave them plain. These are best eaten straight out from oven, and should keep fresh for up to 3 days. Mix together warm milk, active dry yeast, and 5 gram sugar. Let rest for 20 minutes until foamy. In a large mixing bowl, whisk together all purpose flour, 10 gram sugar, and salt. Make a well, then pour the foamy yeast solution, egg, and butter. 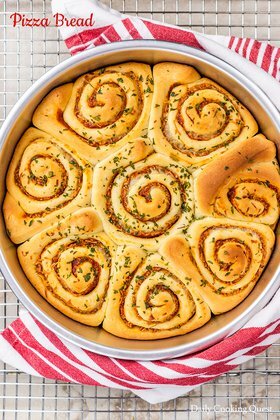 Knead into a smooth, soft, elastic, and non-sticky dough. If the dough is too sticky, you may add 1-2 tablespoon of all purpose flour. Kneading time is 20 minutes. Place the dough in the bowl, wrap with wet kitchen towel or saran wrap. Let it proof until the volume is doubled, about 1 hour in warm kitchen. Punch the dough to release air bubbles, knead for a couple of minutes. Divide the dough into 12 equal portions. Flatten each dough to roughly the size of the slice of ham you are using. Roll the dough into a log. Connect the two ends of the logs so the dough resembles a snail. Cut the dough into two discs about 80% so the two discs are not totally cut apart. Make the two discs face up so you can see the pretty layers. Place this on a baking tray lined with parchment paper. Repeat for the other 11 portion. Let the bread rolls rest for another 1 hour until the volume is about 150% original size. Preheat oven to 200 Celsius (400 Fahrenheit). Mix together 1 egg and 1 teaspoon of water for egg wash. Brush the top of the bread with egg wash, and squeeze/pipe mayonnaise onto each bread roll. Bake in preheated oven for 15-20 minutes until the bread is golden brown. Garnish the top of the bread with toasted crushed nori seaweed or chopped fresh parsley leaves. Best served warm when out from the oven. The bread should be fresh for up to 3 days.